Col's Creating Memories: Whiff of Joy October Blog Hop! Welcome to the October Whiff of Joy Blog Hop! If you didn’t come here from the lovely KARINA'S blog, then head on over to the start of the hop at Whiff of Joy World of Ideas Blog. I don’t want you to miss a single stop on this hop! This month, Whiff of Joy is releasing more special holiday images that will be perfect for all your Christmas creations. Each image comes with one or more lovely sentiments that will help make your project extra-special. We are especially excited with our new die-lights this month. They are absolute perfection and we KNOW that you will adore them. Angel wings, snowflakes…and more! We also have a new German sentiment set and another gorgeous mixed media stamp set from Stephanie Schütze. The hop will remain open until midnight Thursday November 1st CEST. Winners will be announced on the Whiff of Joy World of Ideas Blog. This cutie is 'Kitty' and is so sweet playing in the snow. I have used Teresa Collin's 'Santa's List' papers, the sentiment is WOJ and comes with the image, the Christmas tree is WOJ Die-Light 'Christmas Tree' and comes in a set of three, the charm is WOJ 'Silent Night' and I finished it off with some Wild Orchid flowers and some red pearls and a touch of Stickles. The cat is sooooo sweeeet!!!! Wow das ist ein tolles Bild, ich mag katzen total und bin ein großer Fan von ihnen. Dieses Bild ist wahnsinnig schön und deine Karte ein Traum! So toll wow. Danke für die Anregung. Deine Karte ist der Hammer. Und die Katze süß und frech zu gleich. 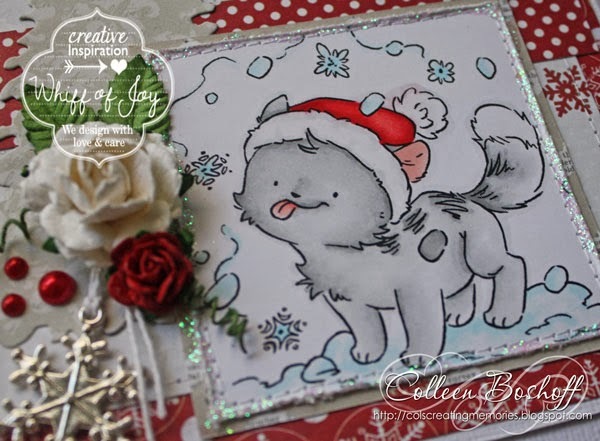 Your card is wonderful.....Love the kitty playing wiht the snow....sooo cute!!! Die Karte gefällt mir sehr gut mit dieser kleinen frechen Katze. Die Katze ist ja süß :) und deine Karte zauberhaft. Wow was für ein schönes Werk!!! Hab herzlichen Dank für den tollen Hop. Is this a nice Catcard . I love the cute Details. Eine wunderschöne Karte. Das Motiv ist so süß. oh i love this image! and your card! So cute is the cat image. So sweet, Love the image and pretty detail. Superb papers too. Adorable! I like the traditional red and white, great stitching to boot. So viele tolle Inspirationen...einfach traumhaft! This little cat is so sweet! Eine schöne Weihnachtskarte. Danke für das teilen der Idee. Beautiful card and the stamp is so nice!! This is so wonderful! I love the cute cat. Love that sweet kitty! Great embellishments on your darling card! Love it! Oh what a wonderful card!! The kitty is so cute! The card is really great and the image is so cute! Like the trees also. Very cute image and you made a wonderfull card creation!